Have you spent far too much time and money looking for a skin treatment that does not work? Your search is over, we guarantee you will be impressed, or we will give you a full refund! G16 Skin Repair Lotion has been developed over the last 10 years and has helped thousands of people restore confidence in their skin. Don't believe the hype? Well give it a go, you have nothing to lose due to our 21 day money back guarantee. G16 Skin Repair Lotion is our newest development and we know that you will love it. G16 is the next generation of its predecessor, the extremely popular G15. G16 Skin Repair soaks in to your skin within minutes of applying and does not leave any clamminess on the skin whatsoever. Unlike G15, G16 boasts results within only 7 days instead of 14 days. 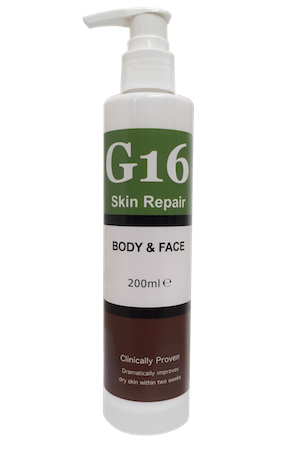 G16 Skin Repair has incredible properties and leaves an unnoticeable micro-layer of lotion on the skin to hydrate it throughout the day whilst penetrating deep where it is needed. The only time you will notice that it is there, is when you bathe and you realise that you are washing the lotion off. Don't just mask the Ichthyosis like other treatments, remove it completely with G16! It works by our unique formulation and manufacturing process of natural acids dissolving and removing dead skin cells attached to the outer layer skin (epidermis) and encourages new, healthy, hydrayted cells to grow leaving your skin glowing and with an amazing feel. The other ingredients then come in to play. The Jojoba oil and Shea Butter gently softens and hydrates the skin and with the lotion's rich Vitamin A, B5 and E content, it penetrates deep to the skin leaving an invisible barrier to help stop moisture leaving the skin. Due to the lotion's unique make up, it is quickly absorbed in to the skin without leaving a greasy layer and has a fresh unisex scent. It is completely safe, and the results are truly life transforming. Formally SR Lotion, G16 Skin Repair Lotion is the best treatment available for these related forms of ichthyosis and it’s time to get that confidence back as we have spent years perfecting G16 Skin Repair which is now helping thousands of people around the world. In fact in a lot of cases it has been seen to completely restore the skin to its normal form within just 2-4 weeks (see before and after pictures above). It has outstanding results on several types of Ichthyosis such as Vulgaris, EHK, X-linked, Bullosa and Lamellar due to our unique manufacturing process. We know that you have probably spent lots of money trying lotions, creams and other products that claim to work, but we assure you that you will be extremely happy with G16 Skin Repair Lotion for Ichthyosis and that you will have the best looking skin you have ever had, which is why we offer a full money back guarantee. Give it a try, you will be glad you did.